Cloudy, damp conditions made for another uneventful day on the Zitziana River and Mooseheart fires west of Fairbanks on Monday. No growth was reported on either of the two lightning-caused wildfires burning approximately 8 miles south of Manley Hot Springs and firefighters spent another day mopping up around structures that were threatened by the fire on the north and east side of Kindamina Lake late last week. A perimeter map of the Zitziana River Fire (#133) and Mooseheart Fire (#204) burning south of Manley Hot Springs. 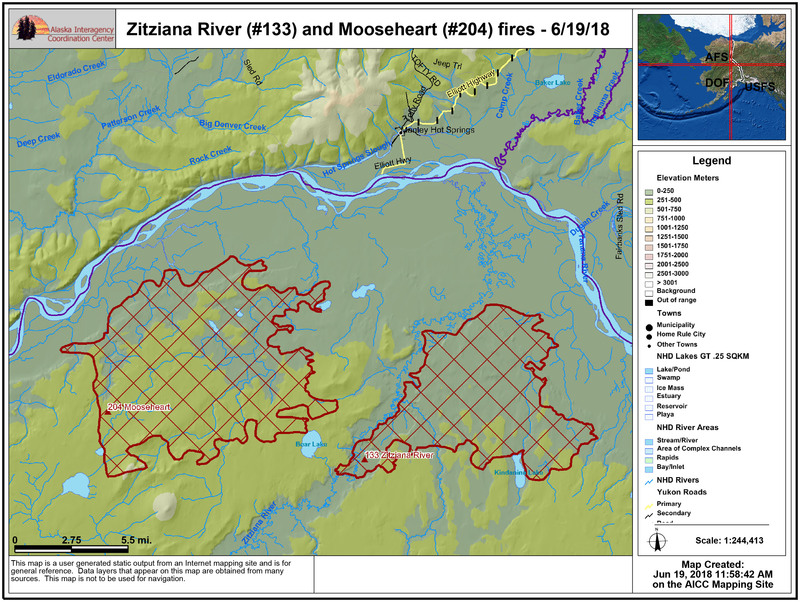 The Zitziana River Fire (#133), which started on June 4, remains at an estimated 34,380 acres and the Mooseheart Fire (#204), which started on June 6, is holding at 52,700 acres. Both fires are burning in a limited fire management option area that allows fires to function in their normal ecological role while allowing for protection of structures and Native allotments that may be are threatened. The fires are being managed by a Type 3 organization from the BLM Alaska Fire Service. The number of personnel working on the two fires will climb to 152 today with the insertion of a 10-person crew from BLM’s Fire Familiarization Program (FFP). Cloudy conditions during the day kept fire activity at a minimum on Monday and that trend should continue today after light rain fell over the fire area Monday night. On Monday, eight smokejumpers and the Tanana Chiefs Conference Type 2 Initial Attack Crew continued setting up protection measures at cabins on the east side of Kindamina Lake. The BLM AFS Chena Interagency Hotshot Crew continued building direct line between the north end of the lake toward a small lake to the west and began identifying and assessing indirect line options to secure cabins on the west side of Kindamina Lake. Eight smokejumpers and the White Mountain Type 2 Initial Attack Crew completed point protection on cabins at Iksgiza Lake and will be moved to other parts of the fire today. The White Mountain crew will be relocated to Kindamina Lake and smokejumpers will move to Mooseheart Lake. The 10-person FFP crew will join the structure protection effort at Kindamina Lake. Four smokejumpers and the BLM AFS Midnight Sun Interagency Hotshot Crew began point protection work on a Native allotment along the Tanana River southeast of Manley Hot Springs about 1.5 miles east of the fire.